Happy Monday everyone ! I wish you all a very beautiful start to the week. I hope you all enjoy today’s recipe. Today’s recipe is Chicken Chili. You can use this same recipe for paneer also by skipping brining process. You can have this dish as appetizer or side dish. Wash chicken properly. Add vinegar, water and salt in it. Keep it in refrigerator for 1-2 hours. This step is called brining. Brining is nothing but hydration of muscle tissue before cooking. This process helps in reducing moisture loss and enhances juiciness of deep-fried chicken pieces. Next step is marination. 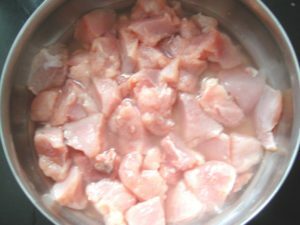 Remove chicken pieces from the brine solution and throw away the solution. 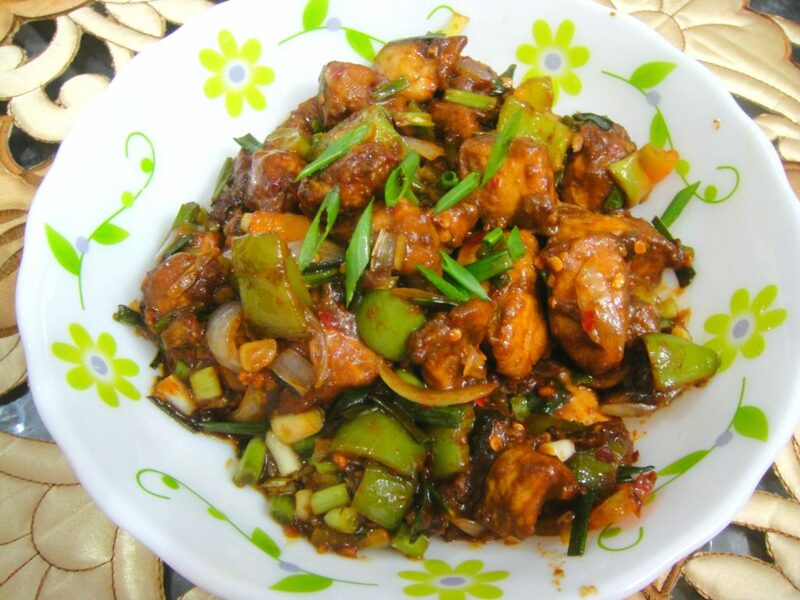 In a bowl, add and mix chicken pieces, soya sauce, salt, red chili powder, white pepper powder, red chili sauce, green chili sauce, chicken chili masala, cornflour and maida. Keep aside this mix for at least 45 mins. For my recipe I marinated the chicken for 2 hours. If your chicken looks dry to you, sprinkle little amount of water on it. 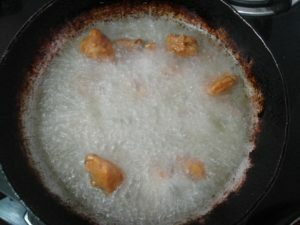 In a deep pan heat sufficient amount of oil, deep fry chicken pieces until they turn golden in color. Keep aside and start preparation for seasoning. In the same deep pan keep only 2 tbsp of oil and remove excess in a bowl. Add chopped garlic and fry it for few seconds. Add capsicum, onion, spring onion and green chili in the pan. Cook till vegetables turn slightly tender but still remain crunchy. In the vegetables now add soya sauce, red chili sauce, green chili sauce, red chili powder, chili flakes, chicken chili masala and salt if needed. Cook for 2-3 mins. 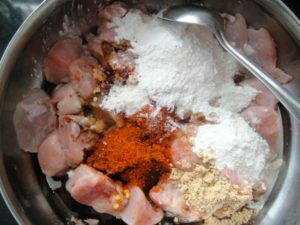 Add chicken pieces and mix. Cook for a minute. Serve hot. I am not using ajino moto and artificial color in this recipe, it is totally up to you If you want to use color for restaurant like look. I would not recommend use of ajino moto in any recipe. If you find above dish dry, you can sprinkle water on it. For chicken chili with gravy, all you need to do is add mix of 1 tsp corn flour and 1/2 cup water in the above recipe in the end. Let the mixture boil and gravy thickens, this is the time when you need to switch off gas. You can use kashmiri lal mirch/deggi mirch to add more color to the dish. 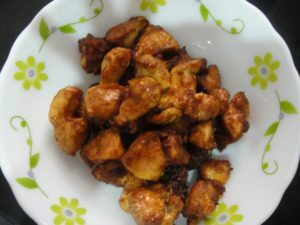 For a healthier version of this dish, you can shallow fry or grill chicken pieces instead of deep frying. Taste may differ in that case. wow ! 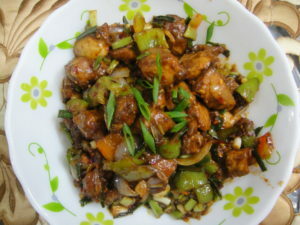 Chilli Chicken, My husband’s favourite food but I am vegiterian, Can we made chilli potato or chilli panner like this.? Yes you can use this same recipe for paneer chili and chili potato, all you have to do is skip brining part of this recipe.